Quinta Freitas is testimony to the reincarnation of a style of property that was enjoyed by the owner as a young child in Madeira. It is reminiscent of the way grand old Portuguese families lived by in the 'good old days'. It has traditional style furniture but it is also a modern property. It was recently built and has a huge skylight in the stairwell to invite the lovely Madeira sun into the home. There are five Bedrooms with large king size beds in every bedroom and five ensuite bathrooms. There is enough parking for the guests if they hire cars and there is regular bus services less than thirty metres away from the Quinta should you prefer to travel by bus. There is a coffee shop/bakery as well as a bar/pub within walking distance of the Quinta Freitas too. Apart from the year round mild weather and excellent 'green' eye-candy you may also just want to stay somewhere nice when you visit Madeira. Somewhere where it is warm, where the south facing position of a very personal and traditional property enjoys excellent sunny dispositions and floral filled gardens, and where the best of heartfelt warmth and welcome is provided by your affable and sometimes gregarious host. With a convenient location near to Funchal City Centre, easy access is had to almost any part of Funchal within minutes, and to the rest of the island from between 10 to 45 minutes. This is a unique property not only for its very spacious living area and large Bedrooms, but also because each Bedroom has their own private ensuite Bathroom which is very important especially for large families or groups. The house is tastefully decorated and is fully equipped with dishwasher, washing machine, and clothes dryer. It also has a large Barbecue area, lots of parking place in case you decide to rent a car and a balcony with sea view where you can sit, relax and enjoy the sunshine! The bathrooms are large and spacious. We are also able to assist you with car rentals and have competitive car rental rates. Large and spacious house at a convenient location. Owner Nelson and his dog Betty are very friendly. Large and spacious house at a convenient location. Garden is beautiful. Owner Nelson and his dog Betty are very friendly and welcoming. Good for a large family or a group of friends. Great base of operations for a family visiting MaderaThis is a very comfortable and commodious property. Nelson is warm, welcoming, entertaining, and could not possibly be any more helpful. Great stay! Our stay at the Freitas Villa was fantastic. I celebrated my 25th Birthday there an got to learn a lot about where my family comes from. The house was beautiful I loved the flowers, scenery, gorgeous house decor and of course SNOOPY. I loveee him so much, he's the sweetest dog, he stays up on top of the garden as a watch dog with Bertha I hope the next guest enjoy him as much as I did, I miss him already. Nelson made this place very comfortable for me and my family, you will enjoy his sense of humor and his stories I highly recommend this villa. Nous avons passé une très agréable semaine en famille à la quinta freitas. La maison est spacieuse, Nelson veille à ce que tout se passe bien. La villa surplombe la mer, mais aussi une zone industrielle. À Noël, nous n'avons pas eu froid malgré le fait que la maison ne soit pas chauffée. Nelson a rendu notre séjour agréable de par sa gentillesse et des bons conseils. We had a wonderful time in Quinta Freitas. Our host Nelson was very helpful with everything we needed and made us really feel at home. The house and the garden were very well taken care of and near the highway to the different attractions. What a great week. I hope the fire has respected the area. The very BEST place to stay! How can i describe Quinta freitas with a few words...ah, yes! We never stayed in such a lovely place before, the owner of the quinta, Mr. Nelson is the good soul of the house, he help´s you with everything you ask him for! The house is great, with many place and it´s got a heavenly garden! You might have seen such a beautiful garden never before! We are sure, to come to Quinta Freitas again and so we can recommend this house to everyone! There is a bakery/snack bar across the road from the Quinta Freitas where you can get fresh bread and pastries on a daily basis and there is also a bar/pub where you can relax and enjoy a “poncha” or “nikita” which is highly recommended. 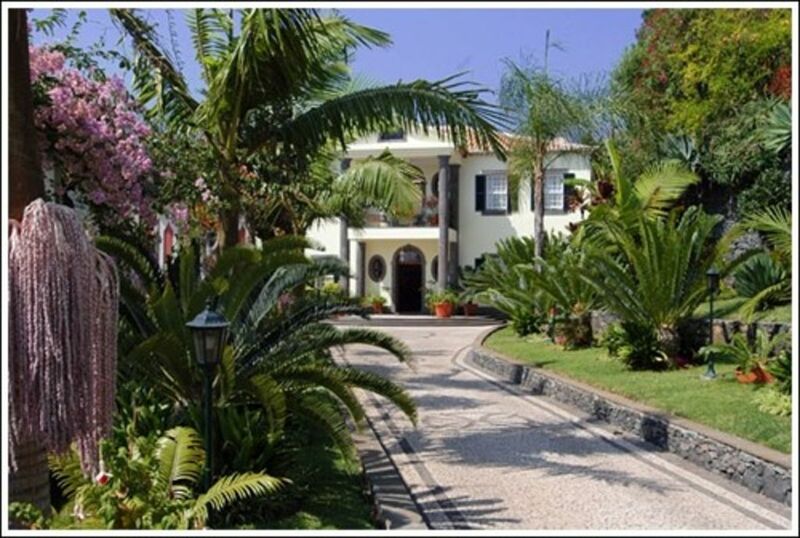 Located in the city of Funchal and a stone's throw from Câmara de Lobos. Very easy access to the ER 101 express way ('Estrada Regional 101' or 'Via Rápida'). Which means you are minutes away from everything. You gain very easy access to almost any part of Funchal or the rest of Madeira. Less than 2 km (as the crow flies) from Madeira's largest Beach: Praia Formosa. Golf: To get to the closest Golf Course (Palheiro Golf) you use the express way (some 500 m) away from the Quinta. Nearly everyone or anyone who wants to play golf has to use the express way to get to the course. So it is as easy as anywhere else on the island to get to the golf course since it is in such easy proximity to the main thoroughfare that leads to the off ramp off the express way to the road that leads to Palheiro Golf. The rates above are for 1-4 guests sharing. Please inquire for SPECIAL OFFERS. Please inquire for rates of larger groups.